St Joan of Arc School for Girls was instigated by an order of French nuns, the Filles de Jesus, in 1904 with just five pupils. The Parish priest at St Mary’s in Rickmansworth, Fr Julien, bought the initial property, 11 High Street, known as ‘Englefield’ and this was to become the original site for St Joan of Arc School. Englefield was the large Edwardian house that currently houses the St Joan of Arc Sixth Form. This was to be the site for St Joan of Arc School until 1922. As the school went from strength to strength so the need for a larger premises became apparent. This need for greater space lead to the Mother Superior (Mother Septima) and Fr Julien acquiring ‘The Elms’. The Elms was a grand Georgian estate built in 1728 consisting of the house and eleven and a half acres with a stream running through the grounds. This created an ideal learning environment for the Catholic girls of Rickmansworth and its surrounding area. The house was famous for being the residence of George Eliot at the time that she was writing Daniel Deronda. The school continued to grow in size and reputation through the early years of the 20th Century until 1951 when it was granted grammar school status. 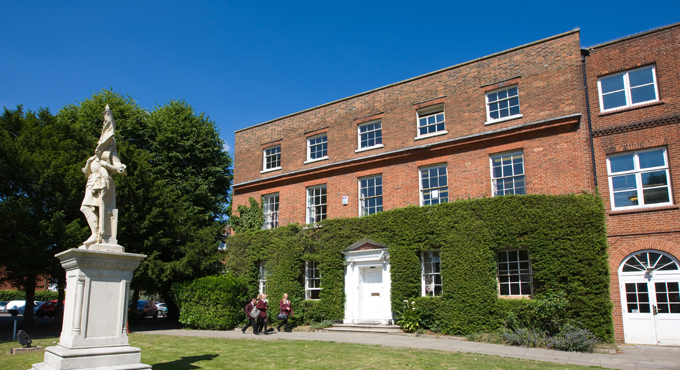 The school enjoyed academic success and ensured that the Catholic Girls in and around Rickmansworth continued to received the best of education. In 1978, as with the majority of grammar schools across the country, St Joan of Arc moved to become a comprehensive school and invited boys to join the community for the first time. The school has continued to grow and develop to meet the changing lanscape of education and in 2012, St Joan of Arc converted to become academy as the founding school of the 'All Saints Catholic Academy Trust' (ASCAT). St Joan of Arc continues to be a beacon of excellence in the Rickmansworth and its surrounding area with the school offering a strong Catholic education to over 1200 pupils from 11 to 18 with the aim of developing the whole person in the light of Christ the Saviour.